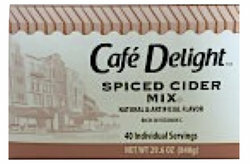 Spiced Apple Cider (40 Count). A great way to warm up on those cold days. Sometime we want something different than coffee and this is a great option. Each box contain 40 apple flavored spiced cider. 40 Servings of apple flavored spiced cider.